"This recipe belonged to Barb Wright who just recently passed away." Combine 3 drops of Acrlyc Paint, Spice - Tan in colour,� with 1 tbsp. Tacky Glue, and mix with a Popsicle stick. Then add 1 Tbsp.. of Cream of Wheat�, mix well. Place blob on freezer paper, waxed side up, and squish into a log shape. Take 4 Popsicle sticks, and stack two together on one side of your log and 2 on the opposite side. Cover over with wax paper. Use your paint bottle as a rolling pin. Keep the bottle on the two sets of sticks while rolling out the log; this will keep it straight on two edges, then you can just square up the ends. "This will then be the correct thickness for your squares." Remove the sheet of wax paper, and let it dry for about an hour. Then peel it off the freezer wrap & turn it over, and let the other side dry. 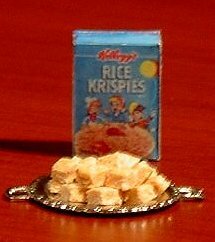 "I determined the size of a regular Rice Krispie Square to be 3"x3"x 1 1/2" thick." When the rectangle is dry, use a straight razor or rotary cutter to cut into squares 1/4 x 1/4. You can decorate with red holeless beads or drizzle on some chocolate (brown gallery glass) for decoration. For a nice finishing touch you can�download the cereal box attached HERE. For marshmallows; a piece of a white foam craft sheet & punch out some circles with an 1/8" punch. "There you are... and they are really easy to make."